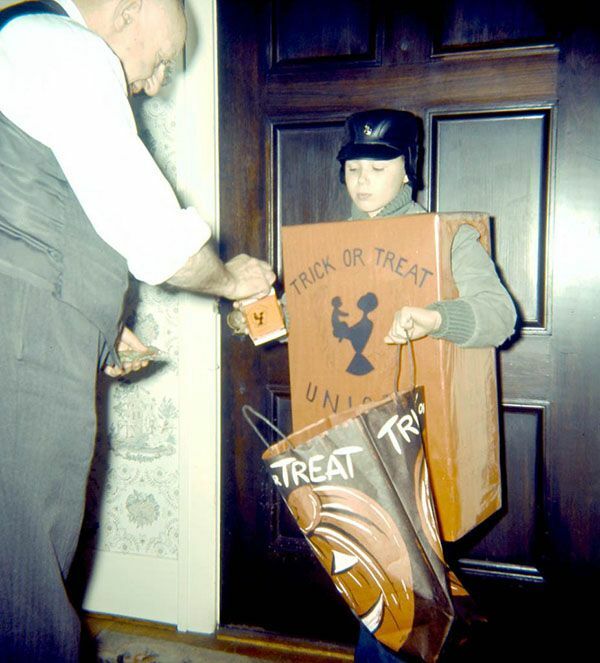 Back in the day, when Halloween rolled around, kid’s toted around a little orange box that kind of looked like a juice box (and later a box of animal crackers!). But they were so much more. Here’s the story behind that little orange box. It started with a school teacher named Mrs. Allison who saw her children’s heavy bags of candy every Halloween and thought all that neighborly fun could be used for good—not just potential cavities. Around that time, she saw a parade led by UNICEF trying to raise money to supply milk to undernourished countries across the sea. Mrs. Allison was so inspired by the parade that she came up with the idea of having children ask for money on behalf of UNICEF as they were trick or treating on Halloween—collected in milk cartons! What started in Philadelphia in 1950 caught on and UNICEF started receiving checks from schools across the nation. 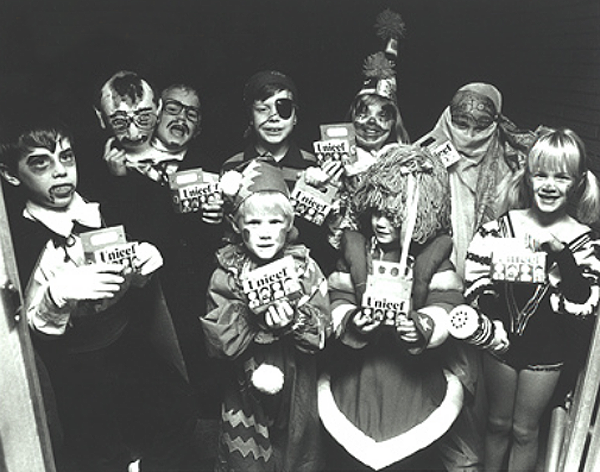 And “Trick-or-Treat for UNICEF!” was born. It became so big that TV shows started helping—there was even an entire episode of Bewitched dedicated to UNICEF. Oh, how I would have loved to have seen that! Even The Brady Bunch joined in the fun. And Betsy McCall, the famous McCall paper doll, dedicated a whole page of Halloween cuteness to the cause! It has been more than sixty years since Mrs. Allison came up with her terrific idea and nearly $170 million have been raised by kids toting UNICEF collection boxes on Halloween calling out “Trick-or-Treat for UNICEF!” These funds that have enabled UNICEF to save and improve children’s lives by providing health care, improved nutrition, clean water, education and more. In 2004, UNICEF took their Trick Or Treat fundraising online and as a result we don’t see too many of those little orange boxes. But Mrs. Allison’s wonderful idea, and the power of UNICEF, continues to change the world. To see how you can get involved with Trick or Treat for UNICEF, check out their site! Did you ever carry a UNICEF carton? Thanks to the Wasthington Post, Book or Treat and Child of the Sixties Forever.